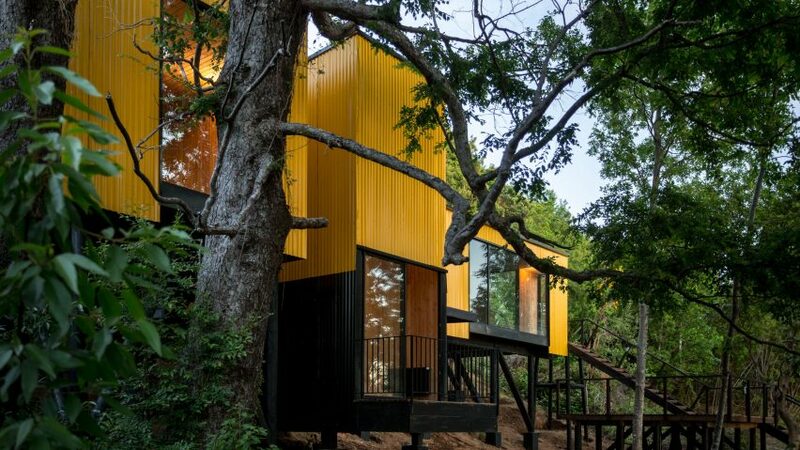 Architect Alejandro Soffia pieced together a series of modules and covered them in bright yellow corrugated panels to form this prefabricated woodland residence in Pucón, Chile. Yellow House is built from a module Santiago architect Soffia designed to be prefabricated in various sizes to suit different functions of the residence – including the kitchen, dining and living room, a library, as well as bedrooms and bathrooms. "The hypothesis is, that if you create a prefabricated system which has good architectural design, then you can reproduce this quality as much as you need it, within the laws of short/long production series," Soffia said. Each is then joined together to form the residence in its entirety. Undulating metal panels painted yellow cover over the structure, giving it a homogenous appearance that drastically contrasts its green setting. While the colour is perhaps the defining element of the residence, the architect made the decision later on in the design process, making Yellow House the property's ultimate name. "When the house got to yellow, on the decision about external covering, the colour was too powerful to conquer the final name of the house," he said. Black panels run along the exterior of the Yellow House, matching the black columns that elevate the house above its sloped site in Pucón. The individual modules hidden underneath this shell, meanwhile, are built from lightweight Structural Insulated Panels (SIP). These are formed of a sandwich construction that comprises an insulated material in the middle and structural board on either side, giving them the "best ratio between structure resistance and thermal isolation". A variety of materials can be used for these two elements. For this project, Soffia selected oriented strand board for the structural support and polystyrene for the middle – he had hoped to use a more environmentally friendly material but the options were not easily available in Chile. "If I could choose, I would be working with mushroom mycelium systems, but it's not so easy yet to do it this way," he said. Soffia also adapted the thickness of the polystyrene, depending on the use of each panel. Structural walls measure 116 millimetres thick, while structural slabs measure 210 millimetres. These are held together by wooden joints. Inside, the walls, floors and ceilings are covered in wooden boards. A number of wooden details, like a staircase and bookshelf are added to match. While some of the woodwork is left untouched, portions are washed black. The kitchen, living and dining room is completely darkened to match kitchen cabinetry, along with a black wood burning fire. A pair of tan leather seats offset these dark tones and face a large window offering views to the forest surrounds. This opening is one of a number that features throughout the residence, with seating similarly placed to make the most of vistas. Additional openings in the walls offer access to small patios. One of these leads onto a wooden deck that steps down through the woodland. Santiago architect Soffia developed Yellow House as part of an investigation into prefabrication methods, with it offering many benefits over other construction methods, such as reduced cost, speed of build and the ability to repeat it. "Architecture faces many human challenges," Soffia said in a project statement. "First, decreasing its impact over nature's equilibrium, and second, building many square metres of good quality for actual and coming population," he continued. "I am right now as an architect, in this second challenge, trying to develop prefab systems with good, true/beauty design." These principals for Soffia's Yellow House could be adapted for many different uses and locations. Other projects that have similarly experimented with the adaptability of prefabricated design include the Monocabin by Milan's Mandalaki Design Studio and American company BoutiqueHomes and an imaginary house in Canada by James Whitaker. Photography is by Juan Durán Sierralta and Mathias Jacobs.